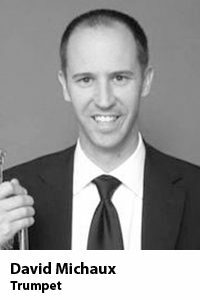 Victoria born and raised, David has been a member of the Victoria Symphony since 2001 and performed as Acting Principal Trumpet for over five seasons. Previously, he held the positions of Principal Trumpet with the Thunder Bay and Okanagan Symphony Orchestras. He has performed with the National Arts Centre Orchestra in Ottawa, as guest Principal Trumpet with the CBC Radio Orchestra, and the Pacific Baroque Orchestra. David also plays regularly as a member of the Victoria Jazz Orchestra. During the 2004-05 season he was a substitute member of the trumpet section of the Vancouver Symphony Orchestra and has performed with the VSO regularly for over twenty years. He was also involved in recording music for the Opening Ceremonies of the 2010 Olympic Winter Games. He has performed as a soloist with the Victoria, Thunder Bay, and Okanagan symphonies. David attended the University of Victoria (B.Mus), the University of British Columbia (M.Mus) and he is an alumnus of both the National Youth Orchestra of Canada and the Aspen Music Festival. His principal teachers were Vincent Cichowicz, Larry Knopp, and Louis Ranger. He has taught at the University of Victoria, Victoria Conservatory of Music, and the Symphony Orchestra Academy of the Pacific.